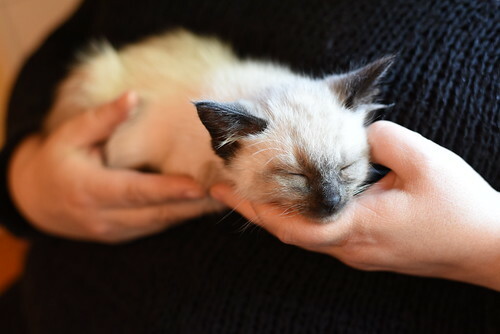 How precious is this sleeping Seymour in the gentle hands of our friend? He woke for a just a moment then fell asleep before he was able to complete a stretch. 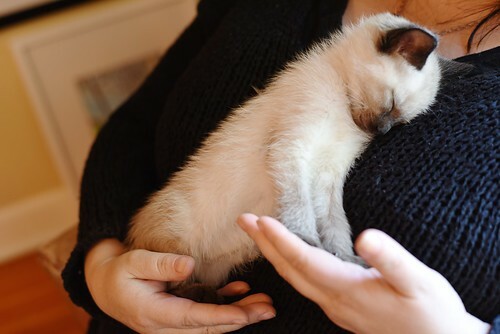 Oh my, what a truly sweet image of such a trusting little creature. Awwww. The scaredy-kitten is gone! That's so melt-worthy. SO sweet. Love the wee paws to the hands. So cute! It's great to see him that relaxed and happy after the fraidy cat start. Awww...Seymour went from mildly wild and feral to the "smooshiest", sweetest. cuddly-est kitty in about two weeks under your care! Amazing! Thank you! He *fell asleep* before he could finish his stretch?!?! I can't even. I simply CAN'T.